I’m excited to launch my new website. My portfolio now includes nearly 100 paintings, sculptures and wall installations. I’ve shared many of these works on Facebook (thanks to all my followers), but I didn’t have one place for you to see all of my work. If you’re interested in what inspired each series, the website includes descriptions of each series. You can see it by clicking “click for series description” on the series page. After you click, the description will open below. The series have up to 15 individual works. And I’m constantly creating and adding more. My biggest artistic passion is Pi Synesthesia, a unique concept I created that combines the digits from the mathematical constant Pi and number synesthesia where numbers are represented as colors and/or shapes. I’ve been working on this concept since I jumped into art following my health scares several years ago. 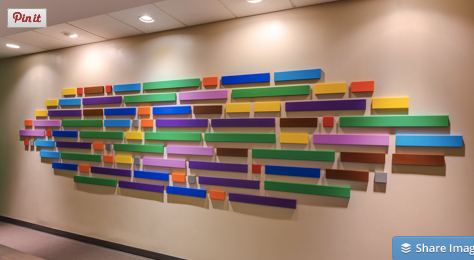 My largest work so far is “Pi 83”, which is in the conference room at OZ Arts Nashville. This work is 15 feet wide and more than 4 feet tall. The segments of this piece reflect Pi (3.1415926…) in two ways. The segment lengths correspond to the digits. The segments are also color coded to the digits. To date, I have more than 15 works in the Pi Synesthesia series. 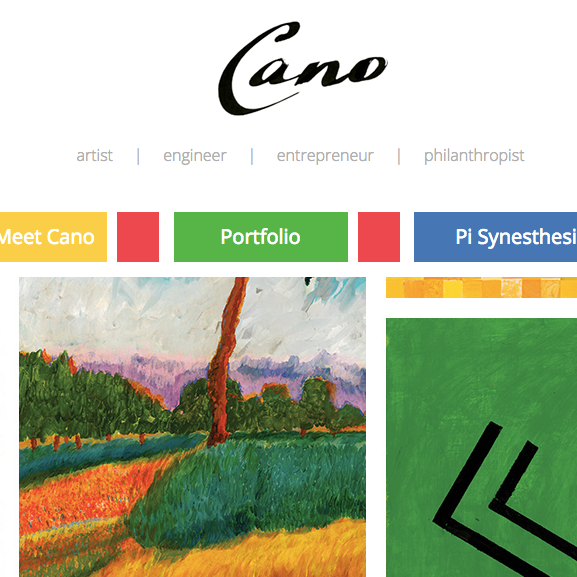 The website gives me the perfect vehicle to share the Pi Synesthesia works and my love of combining art with math. I’m especially pleased that my work has inspired elements of the website design. First is my distinct signature that serves as the website logo. I even have a piece featuring multiple versions of my signature. Similarly, Pi Synesthesia inspired the menu design. The menu is inspired by the first five digits of Pi, 3–1–4–1–5, and number synesthesia where numbers are represented as colors. Overall, I am excited that the website reflects the vibrancy and spirit of the works that I create. I would love to hear your comments about the website or my portfolio.